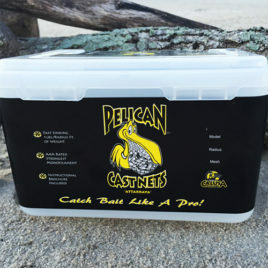 The Pelican™ series cast nets are designed by fisherman for fisherman and brought to you by the number one maker of the highest quality cast nets in the world. The tradition of the Calusa Trading Co. was born from the determination of two fishermen to design and create the most superior cast nets available. The standards upheld by the Calusa Trading Co. leads to the development of cast nets that last for many seasons, throw easily, lie flat and sink fast… and most importantly, catch more bait! 1 lb per foot – coated steel weights. SHIPPING: All of our Pelican cast nets ship for a flat rate of $4.99/each.